The night is speckled with stars over the Peruvian highlands as the Magi follow the star to the manger. Guarded by Gabriel Archangel, baby Jesus sleeps in a hay-filled manger surrounded by Mary and Joseph. 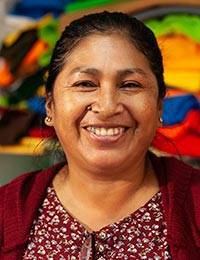 Leonor Quispe works in the traditional art of arpillería (appliqué) to create an heirloom Christmas stocking. Each tiny figure is crafted in three dimensions and lavishly embroidered.